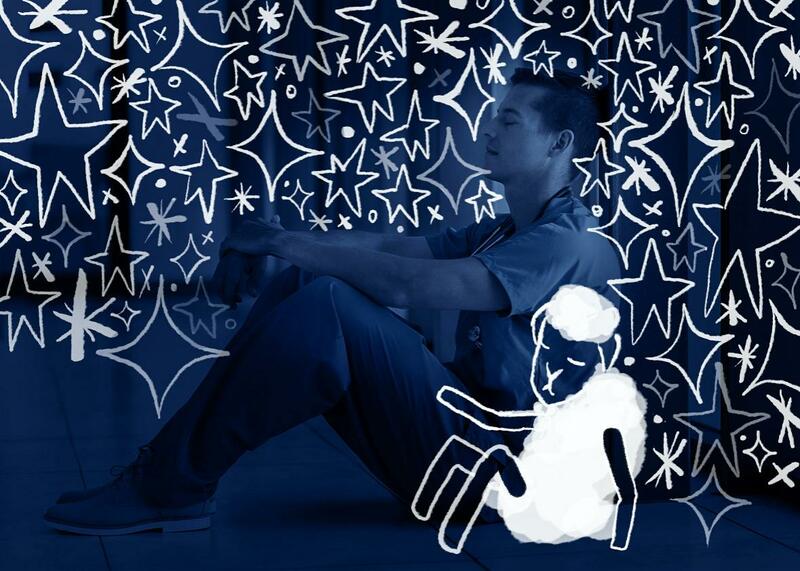 Young doctors needed more sleep, but the plan for them to get it might have backfired. Years Ago, We Decided That Young Doctors Need More Sleep. The Plan Might Have Backfired. Photo by michaeljung/Thinkstock, with additional illustration by Lisa Larson-Walker. For most of modern medical history, the process of training to be a doctor could have been mistaken for some diabolical experiment in sleep deprivation. Hundred-hour workweeks, complete with regular all-night shifts, were standard for young hospital residents—in fact, the health care profession largely looked at such grueling schedules as the only efficient way to teach its craft. As one article in the Journal of Graduate Medical Education put it, “residency training could be likened to an apprenticeship that had features of indentured servitude.” Servants never get much shut-eye. Eventually, though, many doctors and members of the public began to worry that sleeplessness among residents might pose a risk for patients. Fatigued, inexperienced M.D.s, they argued, were more prone to potentially deadly mistakes. In recent years, the governing body that oversees graduate medical training has set rules limiting the hours that just-out-of-med-school physicians can work. The problem? The regulations don’t seem to be doing patients much good. They may even be backfiring. The effort to get fledgling physicians tucked into bed dates back to the 1984 case of Libby Zion, an 18-year-old woman who checked into New York Hospital with a 103-degree fever and spasms; she died hours later after being cared for by the residents on duty. Fatefully, she happened to be the daughter of New York Daily News columnist Sidney Zion. After learning that the young trainee who had treated his child had been on call for almost 24 hours, he sued the hospital and began writing about the hazards posed by overworked medical residents, which drew more press attention. A grand jury investigation of the case failed to yield any criminal indictments but did lay blame for Zion’s death on residents’ exhausting work routines as well as a lack of supervision by senior doctors. Following the recommendation of a high-profile commission, by 1989, New York became the first state to limit residents’ hours. Eventually, the reforms went national. In 2003, the Accreditation Council for Graduate Medical Education, the nonprofit that oversees residency programs, followed New York’s lead and barred residents from working more than 80 hours a week or spending more than 24 straight hours on duty caring for patients. It also guaranteed them the relative luxury of one day off every week. To some advocates, that schedule was still too brutal. A high-profile clinical study found that medical interns made far fewer errors when their shifts topped out at 16 hours instead of the standard 24-to-30 hours. A 2005 study showed that residents who worked a heavy rotation on call suffered cognitive impairment on par with a blood alcohol level of 0.05 percent (high enough that you probably wouldn’t want to drive). A 2007 article in the Joint Commission Journal on Quality and Patient Safety surveyed the evidence and concluded, “Residents’ traditional work shifts of 24–30 consecutive hours unquestionably increase the risk of serious medical errors and diagnostic mistakes and have been shown in a national cohort study to increase the risk of harmful and fatal medical errors.” With pressure building, the accreditation council imposed a new rule cutting back residents’ hours further. Starting in 2011, first-year interns could only work 16-hour days, at max. After that, they had to go home. Shorter shifts mean doctors have less continuity with their patients. If one doctor leaves, another must take over. Work-hour reductions lead to more handoffs of patients, and the number of these handoffs is one of the strongest risk factors for error. As a result, many hospitalized patients are at the mercy of a real-life game of telephone, where a message is passed from doctor to doctor — and frequently garbled in the process. Since Sanghavi’s piece was published, evidence about the effects of resident work-hour limits on medical outcomes has, if anything, become more worrisome—especially when it comes to surgery. Studies comparing teaching and nonteaching hospitals have found that the 2003 reforms were associated with an increased risk of complications for patients undergoing neurosurgery, spinal surgery, and coronary artery bypass grafts, as well as treatments for fractured hips. “The surgical community in particular is concerned about this and feels duty hour restrictions have impaired continuity of care,” says Dr. Karl Bilimoria, a professor at Northwestern University’s Feinberg School of Medicine. The rules are a problem for surgeons in particular, Bilimoria told me, because young doctors find themselves forced to hand off patients in the middle of urgent situations—in the middle of an operation, for example, or while trying to stabilize them in the intensive care unit. Senior doctors, of course, get to stay on the case. But interns and older residents have to switch off, “and it’s simply because their clock is up and they have to leave,” he says. As of now, it’s not clear whether the 2011 reforms that knocked intern shifts down to 16 hours are affecting quality of hospital care at all. A paper in the Journal of the American College of Surgeons didn’t find any relationship between the changes and patient outcomes. But we’ll know more once the results are published from the two large national studies that are using randomized trials to test the issue. In the meantime, there are some signs that interns themselves may not be benefiting much from the latest changes. A 2013 study found that interns who started training after the 16-hour rule went into effect were statistically no less likely to experience depression and no more likely to feel a sense of well-being. They were also more likely to report feeling concerned about having made a serious medical error. Ironically enough, they also didn’t seem to get much, if any, more sleep—just a statistically insignificant 12 minutes extra per night, on average. Read more from The Drift, Slate’s pop-up blog about sleep.